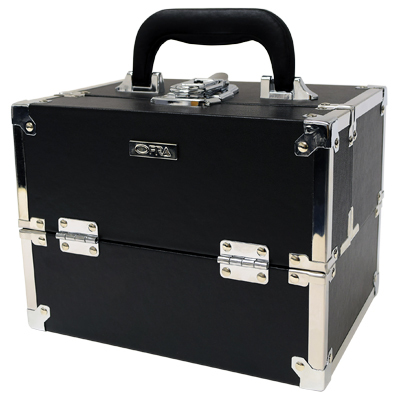 Sturdy stylish black case with latch is perfect for travel and staying organized. Features roomy pockets and expandable trays which permit brushes, applicators, spatulas, and cosmetics to remain tidy and neat. Includes: Magic Roulette Concealer, 2 Translucent Powders, 5 Absolute Silk Peptide Foundations, Wet and Dry Foundation Trio, Bronzer, Blush/Bronzer Illuminating Blush Strips, Pop-up Blush Palette, Spatula and palette (metal), Key, Fixline Eyeliner Gel, 3 Eyeliner Pencils, 3 Lipliner Pencils, 3 Lipglosses, 3 Liquid Lipsticks, Mascara, Eye Gel Primer, Pop-up Eyeshadow Palette, 2 Derma Minerals Loose Eyeshadow Powders.